Deep in the heart of British Columbia's Fraser Valley, just an hour east of Vancouver comes a new musical experience! Four young sisters, multi-instrumentalists, singers, songwriters, and step dancers. 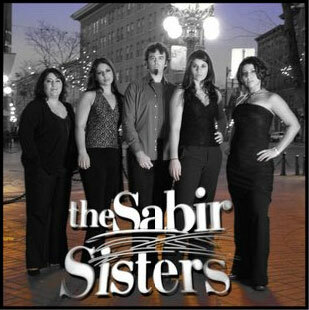 The Sabir Sisters have created an album that demonstrates their unlimited talent. From Ottawa's 1994 Canada Day Celebrations, Scottish Highland Games to Old Tyme Friday Night dances in the Fraser Valley, this talented foursome has done it all. This group has proven to be a crowd pleaser wherever they have performed. Lead Fiddler, composer, and vocalist, eldest sister Shamma was the first female, and youngest B.C. nominee to place in Canada's top eleven at the National Grand Masters Championships in Ottawa. Sarah, the second eldest, brings her experience from the Vancouver Youth Symphony Orchestra to influence the group with a classical twist with fiddle, base and percussion. Roxanna, pianist, fiddler and guitarist, leads the group with her haunting vocals while the youngest in the group, Laila, is known not only for her gift for fiddling but for her high-stepping dance routines. The Sabir Sisters high energy performances bring a new sense of fun and frolic to traditional Canadian music. Their diverse repetoire finds a niche in the hearts of audiences that transcends culture and age. Their repetoire draws upon their rich heritage from jam sessions with Johnny Arcand and Calvin Volrath, with a deep sense of Metis culture that imbeds itself into their traditional compositions. Exchanging tunes with Richard Wood and Ashley MacIsaac have resulted in traditional tunes with an electrifying twist, and the echoes of the prairies is evident in their haunting vocals. Noteable Entertainment & Events is a Vancouver based booking agency, party rental, entertainment services and event production company. If you are interested in booking The Sabir Sisters please contact us.